One of our greatest joys at Circle M is sharing the farm with others. There are so many wonderful things to see and do here in beautiful Blanchardville and nearby in the gorgeous Driftless Region of Wisconsin. Come for a short day retreat or stay for the night, weekend or week! Book a farm stay in conjunction with a farm skills or fiber class to take while you are here. Bring clothes you can get dirty if you plan to join in on whatever farm work is happening on the days of your visit. Bring a bathing suit to lounge in our stock-tank wood-fired hot tub or go swimming in our municipal pool. Bring waders for trout fishing, bikes for riding, boots for hiking. Rent kayaks, canoes, ATVs, or horses while you are here. 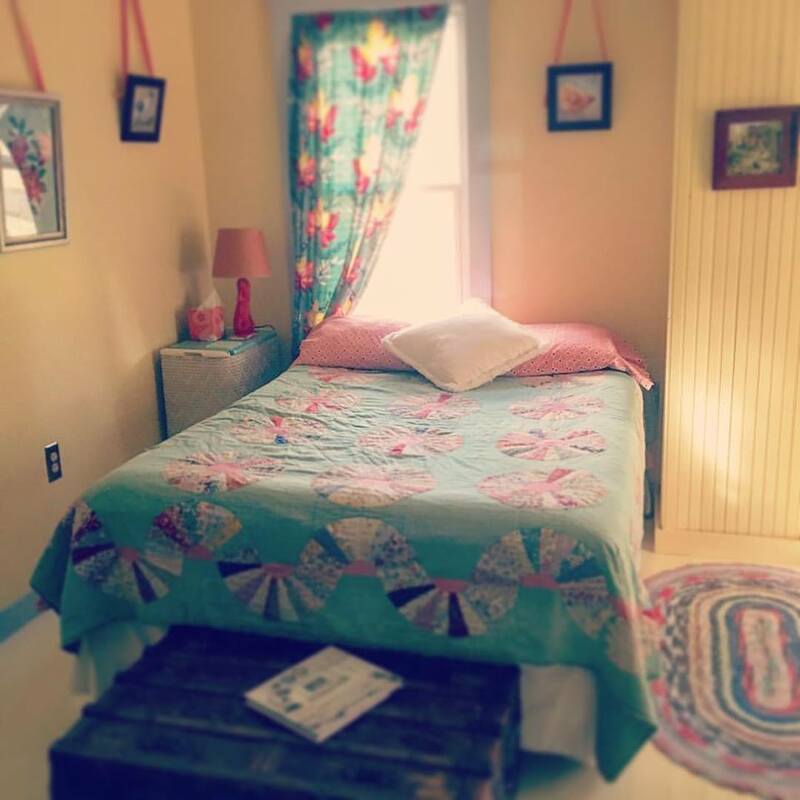 Book from the Contact Page or search our AirBnB listings under Circle M Market Farm. Our charming old farmhouse is a great joy to us. We've added to it over the years, just like the previous farming families, to create studio and classroom space, as well as more bedrooms. Our adorable second floor is yours to use. We have two guest rooms; each with a double and a twin bed. In between, there is a large bathroom with shower and tub. 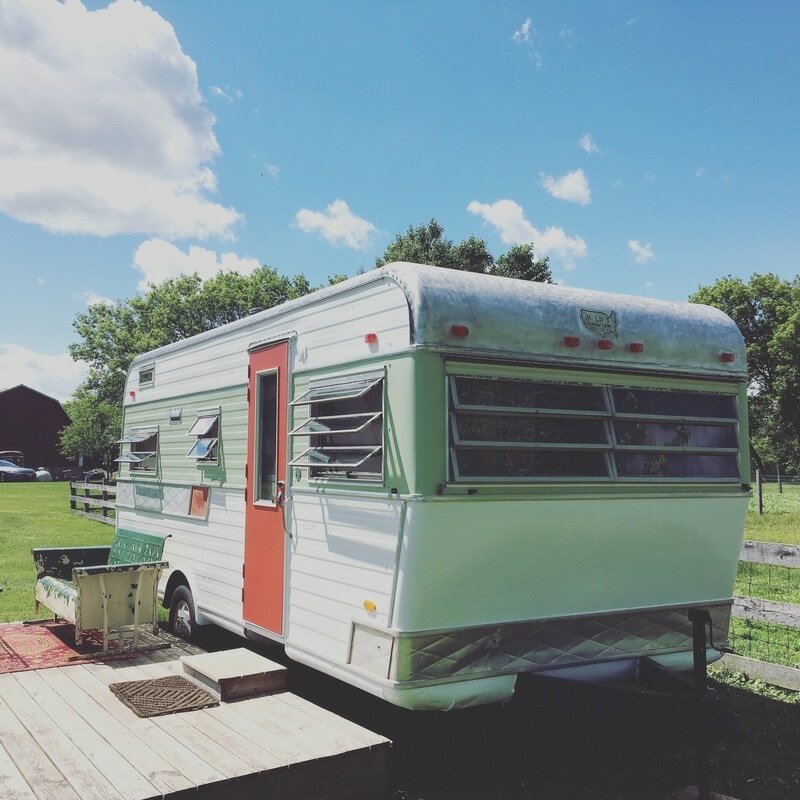 You can also stay in our 1968 Holiday Trav'ler camper! Our style is a 40s-vintage vibe and we love love love antique linens. Our beds are loaded with quilts, down pillows and layers of crisp cotton. The camper is stocked with board games and you are free to play outside on the picnic tables by the praire. We are happy to share our cozy downstairs living room (three couches around the woodstove) if you'd like to hang out with us. Lawn games are yours to use, and there is a children's garden with a tractor tire sandbox and water trough paddling pool. During your stay, you always have access to our extensive homesteading library and wi-fi, but you won't find a television screen. Instead, curl up with the latest Martha Stewart, Traditional Home, Real Simple, National Geographic or a novel from our shelves. Breakfast here on the farm is one of the highlights of our day, with hand-roasted coffee, homemade Circle M sourdough bread, a waffle bar, eggs from the henhouse, sausage from our hogs, cream from our goats and a creative menu that uses the best of what we've got growing in the gardens seasonally. Get up early and you can help us pick the raspberries, peaches, plums, apples, strawberries or pears for the meal! You can even help us milk the goats. Our fees vary depending on your group size, ages and activities, but you can expect to pay something like $135 a night per room: ginormous breakfast and farm tour included. If you just need a quiet inspirational place to come for the day to write, walk, meditate, pray or think - we'd love to provide that to you along with coffee, tea and some nibbles - $50 per room. If you are coming equipped with your own tent or camper, you can pick your spot on the grounds, and share a bathroom and breakfast with us for $75 per couple. Additional guests are $25 per person. Everybody who stays at Circle M is welcome (but not required!) to join in the work, because we believe that’s the greatest gift this farm has to give: good, satisfying and truly productive work for human hands and hearts. Visitors have done everything from participate in sheep round-ups to building and painting barns and sheds. We’ve got good work here for every age group and ability, and a farm stay here can always involve a few minutes or a few hours a day of appropriate labor. Let us know ahead of your stay how much work you'd like to be a part of and we'll have something planned that suits your ages, interests and abilities. Your family might enjoy wandering among the animals on pasture digging up thistle or other invasive species. Or perhaps you’ve got teens who’d enjoying clearing brush out of hedgerows and celebrating at the end of the day with a huge bonfire. Maybe you’ve got an engineering or design background and you’d like to give us some input on whatever building project is up next. 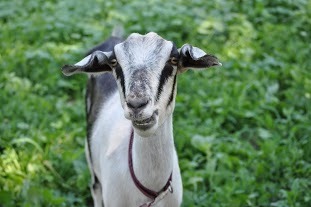 There are always hooves to trim, fleeces to wash, and flower beds that need weeding. Of course, hard work always makes for especially satisfying rest times, and above all we’d like your stay here to be renewing and, ultimately, relaxing. We have local canoe and kayak rentals available for exploring the beautiful Pecatonica River which borders our property. We steward a wetland and a trout stream, with small ponds for heron-watching, and lots of lovely walks in every direction on either paved roads or sand paths. There is a boat launch across the street and you can jump right into the creek there and swim. 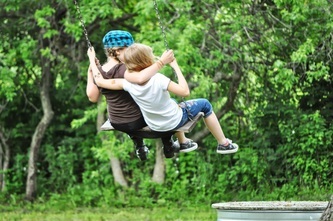 We’ve got more swings than any family can use and picnic tables and benches placed all over the property for breaks in varied settings. We love lawn games and we've got lots of them, including the every popular Carpetball. Evening activities include soaks in the fire-heated hot tub, cozy visits in front of the sitting-room woodstove and marshmallow roasts over the campfire. Just a 10-minute walk away, our tiny town boasts three bars and a diner, in addition to a swimming pool, tennis courts, and basketball court. 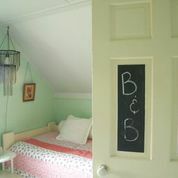 We have an antique store and a home goods store that hosts sign-painting parties. Most weekends you can hear live music in one of the bars or in the park pavilions. Within 30 minutes' drive, you can visit the delightful historic towns of Mineral Point (Cornish), New Glarus (Swiss), Mount Horeb (Norwegian) and Monroe (Swiss Cheese Capital of the USA! ), all of which have excellent Rails-to-Trails biking/hiking/atv paths and shopping. If you are interested in some of the challenging and gorgeous Road Riding we have around here, we will pick you up at your finish line. We are also within 15 minutes of Yellowstone Lake State Park and 40 minutes from Governor Dodge State Park. You can even see a double-feature at one of the country's few remaining drive-in theaters, the Sky View, which also has excellent food. ​Heaven on earth here in Wisconsin! We love when folks come out to stay for a couple of nights and take classes during the day. Intensive immersion classes are a great way to learn and we feel we can really pass on a lot of information and skills in these settings. 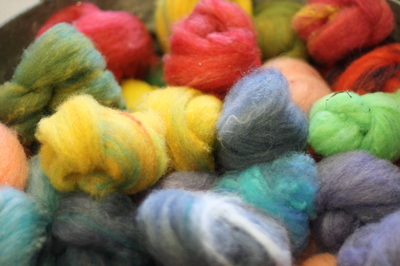 Our areas of expertise include beginning gardening and market farming, as well as beginning and intermediate woolcraft: dyeing, spinning on wheels and drop spindles, felting and knitting. We also teach classes in soapmaking, herbal scrubs, decoupage, and up-cycled accessories. Our leisurely on-farm classes often include wine, cheese and other age-appropriate snacks. See what classes we have to offer and call us to create a custom curriculum for your stay. Book as a group of 3 or more and get discounted class rates.